The Drager HPS 3100 - a multi-functional and universal helmet for the various demands of emergency teams in search and rescue missions, for forest and bush firefighting, road accidents, height rescue and any kind of technical support operations in emergency situations. The safety helmet Drager HPS 3100 (Head Protection System) was developed in close cooperation with fire departments and aid organisations. The multi-functional helmet is designed especially for all needs during outdoor operations. One helmet for all applications - search and rescue missions, wild and bush fire fighting, road accidents, height rescue, hazmat incidents as well as all types of technical support operations. With its modern design and structure the helmet is a combination between industrial safety helmets according to EN 397 and mountaineer helmets according to EN 12492. The extremely robust painted helmet shell made of durable thermoplastics provides high and comprehensive protection. 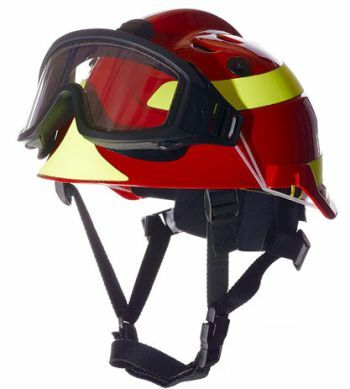 A ventilation system is fitted in the helmet both-sided of the comb which ensures an optimal climate inside the helmet, especially during long-lasting forest firefighting or exhaustive rescue missions. The ventilation system is equipped with a metal mesh that prevents ingress of sparks, cuttings or other particles. Moreover, the ventilation openings can be sealed completely during operations via an easy to operate slider, even when wearing gloves. The high wearing comfort results from the modern interior design and the 4-point harness. The harness can be individually adjusted via a fastening system both in the area of the neck and the temples. The chin strap is fitted with a chin loop and fastened by a buckle - it can be easily adjusted via velcro fasteners. The adjustment wheel for the individual head size adjustment is simply and safely accessible with gloves. The complete head ring and the neck area are padded. The integrated hair net is used for height adjustment and provides an excellent wearing climate. An inner shell made of polyurethane fits perfectly to the outer helmet shell and increases the mechanical resistance for effective head protection - at the same time it ensures heat insulation inside the helmet. The interior design is made of skin-friendly materials which are anti-allergic, sweat- and mold-repellant and breathable. For cleaning and servicing the complete interior design can be removed without any tools. The safety goggles provided with the Drager HPS 3100 as a standard are made of a flameproof material and fit optimally to the helmet shape. They are approved to EN 166 and EN 14458 and meet the impact resistance requirements of protection class B. The ergonomic design of the spectacles frame made of polyurethane provides highest wearing comfort. The goggles are ventilated passively and in combination with the modern anti-scratch coated double-lenses system (Pinlock) made of polycarbonate they are optimally protected against fogging and scratching. There is an wide range of accessories available for the Drager HPS 3100 - thus the helmet can be adapted to the most diverse and individual applications - according to the motto "One helmet for all applications". Visors and ear protection systems are safely adapted to the helmet via a multifunction adapter. Special visors such as mesh visors and electric visors are available especially for work with a chain saw and protection against electric arcs when working with high-voltage systems. The range of accessories also includes helmet lamps as well as lamp holders, ear protection systems, PC visor as an alternative for the safety goggles, a neck curtain made of flameproof Nomex material and reflective strips of various colors.